The other side of the park has Matterhorn Mountain, but this side has its own landmark peak. 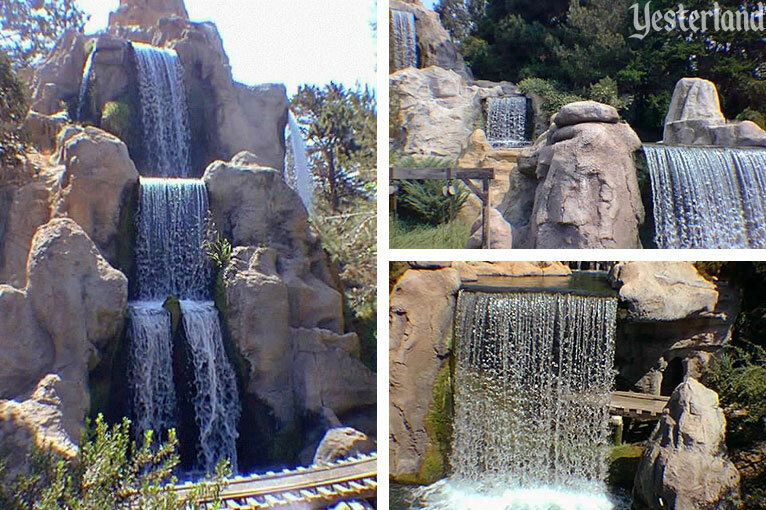 Around half as tall as the Disney version of the famous Swiss peak, Cascade Peak has more impressive waterfalls. Although only 75 feet tall, the peak looks bigger than that because of the sense of scale from the small evergreens at the base and on the mountainside. The best way to see Cascade Peak is from the Mine Train through Nature’s Wonderland. Sitting in an open-air ore car, you go right by the biggest waterfalls in these parts—passing behind Big Thunder and in front of the Twin Sisters. Cascade Peak is not just a show scene on the Mine Train ride. It’s a Frontierland landmark, enjoyed by guests on the Mike Fink Keel Boats, Mark Twain, Sailing Ship Columbia, and Indian War Canoes, as well as from Tom Sawyer Island. 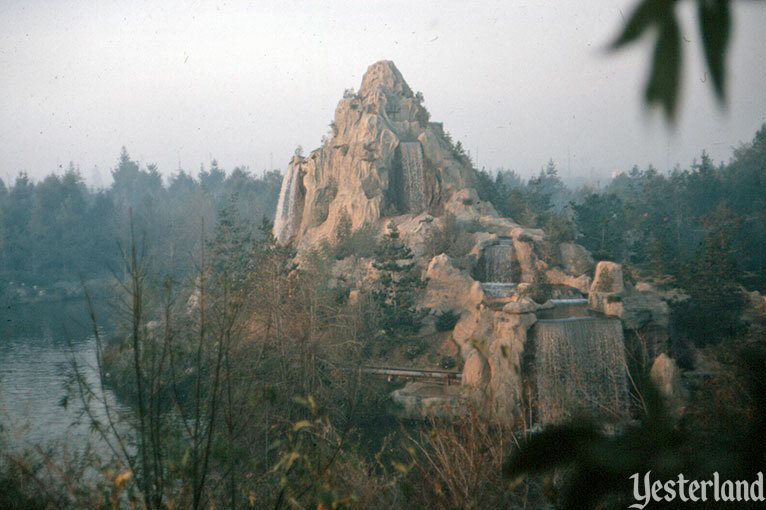 Cascade Peak premiered at Disneyland as part of the Mine Train through Nature’s Wonderland, which opened May 28, 1960, replacing the Rainbow Caverns Mine Train (1956-1959). While Walt’s words overstated the animation of the manufactured animals, the waterfalls of Cascade Peak more than lived up to their promise. 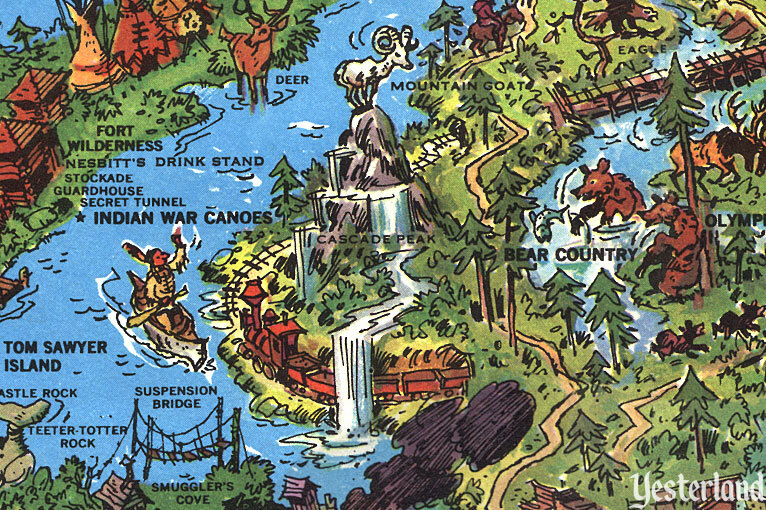 The final day of the Mine Train through Nature’s Wonderland was January 2, 1977. In its place, Big Thunder Mountain Railroad opened September 2, 1979. But the footprint of the thrill ride was smaller than that of what it replaced. Cascade Peak survived another 19 years. 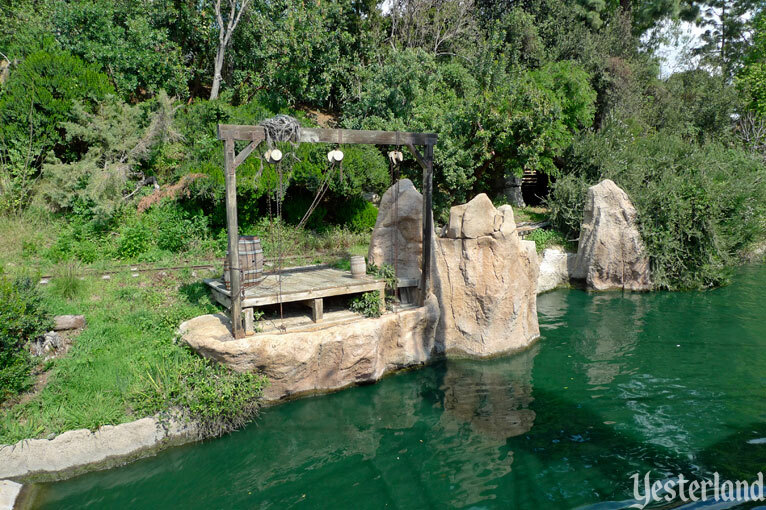 After the demise of the Mine Train, Cascade Peak was still enjoyed from the various vessels that circumnavigated Tom Sawyer Island, as well as from the island itself. The trees around Cascade Peak grew bigger every year, but the mountain stayed the same size. In its later years, the soaring peak from 1960 seemed to be a fraction of its original size. 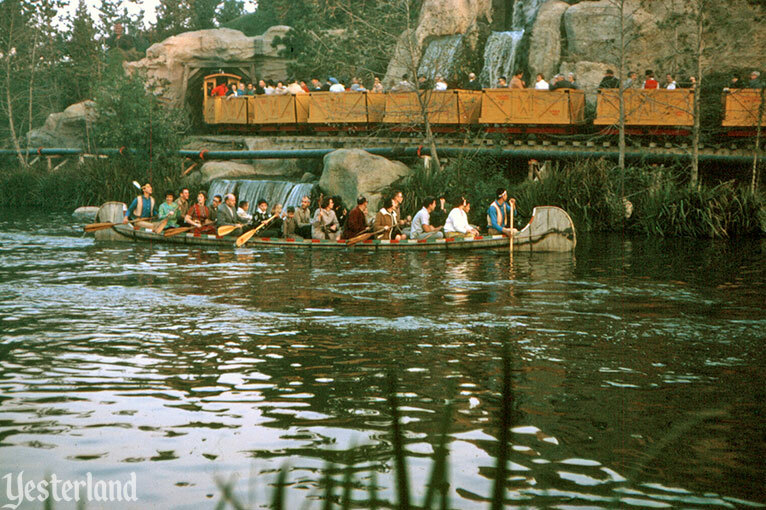 Still, it was an impressive landmark on the Rivers of America, with roaring waterfalls not only delighting guests, but also aerating the water. 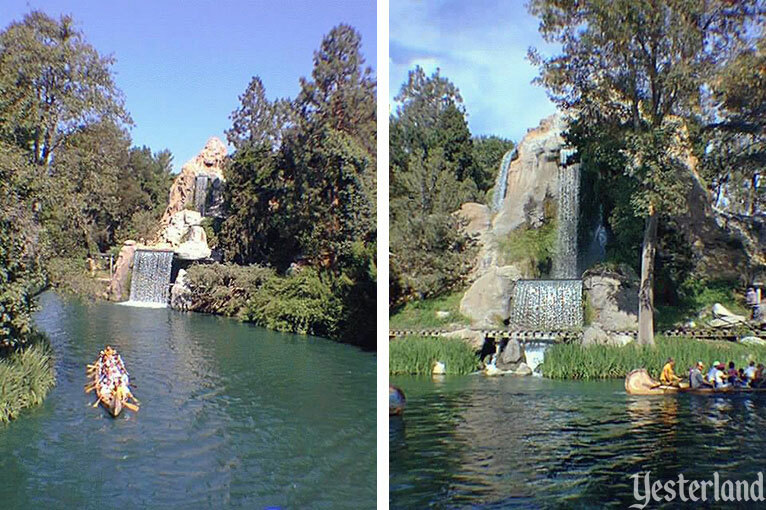 Cascade Peak fell on hard times under the regime of Disneyland president Paul Pressler in the 1990s. The peak no longer received the maintenance it needed. Reducing expenses was more important than maintaining show quality. Reports at the time suggested that water had severely damaged the structure. Instead of giving the structure and its faux rock skin the TLC they needed, the landmark was deemed expendable. Cascade Peak was demolished in Fall 1998. All that was left was a low mound of soil and some of the rockwork at the river’s edge. The site was replanted. 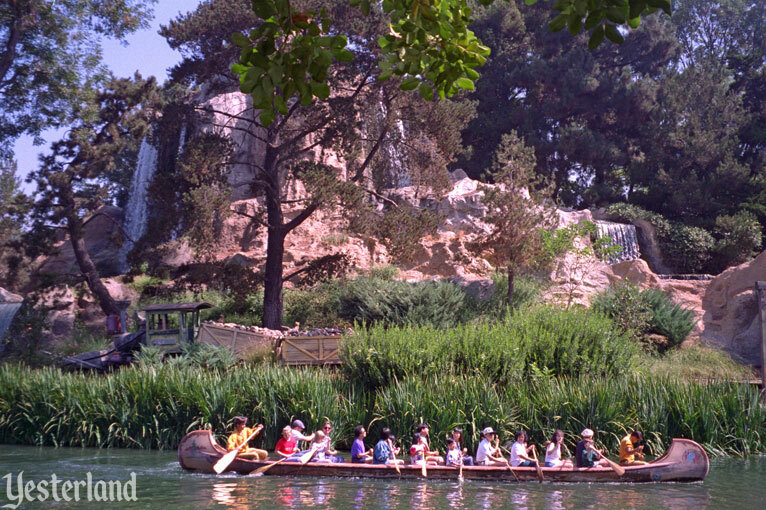 Guests on the Mark Twain, Sailing Ship Columbia, Davy Crockett Explorer Canoes, and on Tom Sawyer Island could gaze at trees and shrubs where majestic waterfalls had once cascaded down from the peak. And that trestle goes over waterfalls. Lots of waterfalls. Impressive waterfalls in the tradition of Cascade Peak.